The Krannert program builds upon Purdue’s world-class excellence. The key feature of the program is the residency approach. This means that for each module, students work on homework assignments, group projects, and online discussions for about 10 weeks and then come to campus for a one or two-week residency. During the residency, the faculty applies the assignments the students have done during self-study and help apply it to their companies. This is in contrast to most executive MBA programs where students come to campus every weekend or every few weeks. Our approach allows people to come from anywhere in the world (which they do) and not have to drop from the program if they switch jobs or are relocated to a new city. The concentrated residencies allow the students to focus on the classroom, so the learning is heightened and the lessons can be applied immediately in their companies after the residencies. There is a keen emphasis on team and the sharing of expertise, so students learn not only from the faculty, but also from their peers. The residencies facilitate the formation of networking and friendship bonds among students that last a lifetime. The Executive MBA program’s electives also break from the traditional approach found at most schools in which students take the same courses with their cohort, with the same offerings repeated annually. In contrast, our students can choose functional electives specific to their cohort as well as immersion electives tailored to their particular interests. What are the qualifications for admission to the program? To be admitted to the program, the applicant must have: 1) A bachelor’s degree and transcripts, 2) Five years post-baccalaureate work experience, 3) A completed application, and 4) Two recommendations. GMAT and TOEFL may be required, depending on your work/educationbackground and strength of your application. At the beginning of each module, the faculty provides a syllabus with all homework assignments for the module. Students complete these homework assignments per their own schedules — evenings and weekends — and send them to the faculty electronically. This self-study takes about 15-20 hours per week, but students choose the time and still manage to complete work assignments for their company, as well as have time for family. Some of the assignments will be team-based. For some classes, there are also team and class-based online discussions. What are my fellow students like? Recent incoming classes have had between 25 and 30 students. The work experience ranges from five years (the minimum requried for admission) to nearly 30 years, with an average of 15 years. They are all hardworking individuals, like you, who believe an EMBA will provide them with more opportunities. Many have families and are also balancing work-home-school demands. Will I be expected to work alone or will I be assigned to work with a group of my peers? The type of work depends on the course material. Some work is done individually and some is done in groups. The professor’s syllabus will always provide details on these points, but all teams generally meet weekly. Where do classes meet and where do I stay while in-residence? The orientation and the first five residencies are at the Krannert School of Management Executive Education building at Purdue University in West Lafayette, IN. The last residency is at an international location, or locations, chosen by the cohort in consultation with executive education staff. Students have individual hotel rooms during residencies. At Purdue, students stay at the historic Purdue Memorial Union Club Hotel across the street from the Krannert School of Management. Yes, we interview all applicants either in-person or virtually. The goal is to ensure that there is a good match between students’ interests and what the Purdue Executive MBA can offer. We accept applications throughout the year and students are admitted on a rolling basis. Please find application deadlines here. How much does the program cost? What does the cost cover? The program costs approximately $85,000. This covers tuition, lodging during all the residencies, most meals during residencies, networking/social events, class materials, and an ipad and ebooks. The primary expense for you would be travel. Payments are spread out over five installments over three calendar years, making it easier to gain financial support from your employer or for obtaining government loans. Yes, scholarships are available. To be considered for a scholarship, complete the scholarship essay found in the online application. Scholarship decisions are made based on a complete review of application materials as well as the interview. As the amounts of the scholarships are provided on a rolling basis, it is to your advantage to apply as soon as possible. Questions regarding scholarships should be directed to the executive director, Aldas Kriauciunas, at akriauci@purdue.edu or 765-496-1860. Do you offer career development services? The program offers a broad set of career management support and resources. As a starting point, within the program and in the Krannert School of Management, you will have access to a career counselor who is available to discuss career management ideas and direct you to the appropriate resources. These resources include the Purdue Career Wiki, which is a comprehensive, online resource consisting of career guides, company/industry databases, and business news. We also partner with Ivy Exec, which offers resume review, mentoring, and online education opportunities. Finally, you have the opportunity for a series of one-on-one executive coaching sessions which guide you to develop your desired end-point, assess your current situation, and create a path to achieve the career opportunities you seek. We use a rolling admissions decision process. After you submit your application, our Associate Director of Admissions will review the documents to assure all pieces have been received. Then the applicant is contacted for an in-person or virtual interview. The interview takes about 90 minutes and two members from the admissions committee participate. After the interview, the admissions committee meets to review the materials and make a decision. If it is a positive decision, the materials are provided to the Purdue graduate school for final review. It generally takes two weeks from application submission until a decision is made. Is it possible to visit a class in-session? We always welcome visitors to the classroom, since seeing the program in action is the best way to learn about the program. 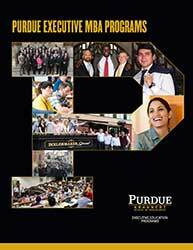 Our EMBA Experience days, held throughout the academic school year, include a presentation about our programs, a class visit, lunch with current students, and a complimentary overnight stay at Purdue’s historic Union Club Hotel. Call Krannert Executive Education Programs at 765-494-1554 for information about EMBA Experience. What does the curriculum entail? The curriculum covers the principles of business and management within a global context. Core classes include focused topics like accounting, finance, operations, marketing, economics, and analytics. They also include more integrative topics like strategy, leadership, risk management, and law & ethics. Further, as a cohort, you will choose three functional electives, from a list, that are of greatest interest to the cohort. Recent selections include mergers & acquisitions (M&A) and negotiations. You will also select three immersion electives. These are electives that you take with a sub-set of the cohort. This workshop-style elective lets you go deeper into topics of personal interest such as crisis management, finance, game theory, managing teams, presentation skills, and more. Finally, you will complete a consulting assignment where you scope a project and then create solutions based on your own knowledge and insights gained from the program. How does the IMM Global EMBA program differ from the Executive MBA? The IMM program is primarily for those who imagine a global career progression or desire to learn about different cultures and economic systems. Instead of meeting at Purdue each quarter, students meet at different partner schools in the U.S., South America, Europe, and China. Participants also receive a Purdue EMBA and an EMBA from Tilburg University in The Netherlands. The Executive MBA does have more electives, allowing for a more tailored program to student interests, and fewer international travel requirements. Have more questions? Fill out and submit the form below and we will happily get back to you.